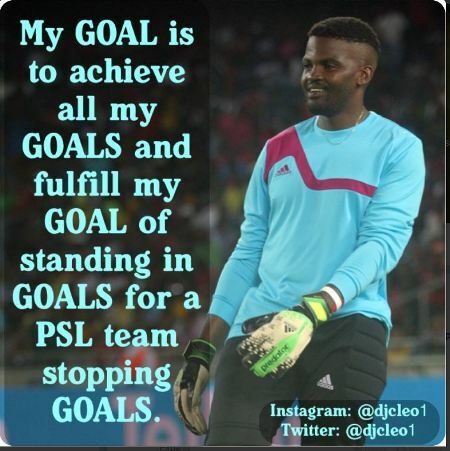 Cleopas Moneypao popularly known as DJ Cleo has quit playing music and wants to become a soccer player. It's not often someone decides to take to the soccer field when he's in his thirties but DJ Cleo doesn't seem to have any problem with it. The popular disc jockey wants to swop his decks for soccer gear. Cleo, whose full name is Cleopas Moneypao, wants to play soccer professionally and is currently training with Bidvest Wits, he said on Power Fm. The 34-year-old acknowledges that starting a football career at his age might be difficult but he says that generally goalkeepers are older than the rest of the squad. "Keepers can go till 40," he said. The move from professional musician to potential soccer player has surprised many people but Cleo is determined to achieve his goals. The move has also made him subject to a lot of ridicule. But laughter and ridicule don’t faze him and a lot can be admired in his can do attitude. Here are a couple of pictures he shared on his Twitter account that show he is ready to tackle the soccer world.